I’m not always sprung on the big ol’ dumb, vulgar, “high concept” (ironic turn of phrase) film comedy. There is an army of moviegoers who can quote every line from the National Lampoon’s Vacation series, Airplane!, Neighbors, The Naked Gun or Horrible Bosses. I’m not that fellow. There are exceptions for me – Bridesmaids, the FIRST Bad Santa, Bad Words, Borat. Maybe the naughty movies I like all must start with the letter “B”? I’m no prude, and I don’t mind seeing some big screen debauchery, as long as it’s in service to a story. And if the ribald flick in question celebrates a misfit or two, giving the marginalized among us a chance to shine? All the better. Let’s just say I’m shocked how much I enjoyed Office Christmas Party. On its surface, it looks like a frat boy fever dream (and it sort of is), waving the PARTY! bro culture flag from a wobbly pedestal of cheap beer kegs. 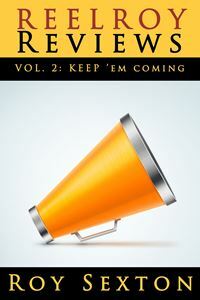 Yet, something else is afoot in this particular entry of a tired, yet lucrative, genre: kindness. The narrative is feather weight. A tech company in Chicago struggles to find its footing after the death of its founder amidst the Cain-and-Abel feuding of his two children. T.J. Miller (Deadpool) plays Clay, a Millennial ne’er-do-well with a Santa-sized heart-of-ADHD-gold, and Jennifer Aniston is an arsenic-in-the-eggnog hoot as sister Carol, a Scrooge in training for whom the holidays are a mind-numbing drain on the firm’s bottom line. With an interest solely in her standing with the company board and with Wall Street, Carol cancels all holiday festivities and threatens drastic job cuts throughout the charmingly dysfunctional organization. (A timely holiday tale this!) Consequently, Clay schemes with his merry band of misfit colleagues (Jason Bateman, Oliva Munn, Kate McKinnon, Rob Corddry, Vanessa Bayer, Sam Richardson) to throw the be-all-end-all of office holiday shindigs, in an effort to save their year-end financials (and thereby the company) by wooing a potential new client (Courtney B. Vance, simultaneously slumming and classing the film up, a deceptively understated and utterly charming performance). The titular party itself – ostensibly the centerpiece of this admittedly overlong movie – is perhaps surprisingly not the film’s high point. There are funny bits once the sozzled chaos kicks in, but mostly the soiree itself is cluttered and silly, not particularly funny, badly filmed, and occasionally too gross to be believed. However, I saw the party the way I see the shark in Jaws: a necessarily evil around which to hang the much better and more engaging story elements and performances. You know the shark is coming, but it is the suspense of getting there and the fall-out after the fact that is really interesting. Bateman, as the company’s chief tech officer, is less smarm, more broken-hearted sweet than I’ve ever seen him. That color looks good on him. Munn is world-weary, observant fun as Bateman’s development partner, whose feminist savvy and tech smarts ultimately save the day for all. This brings us to Miller. I suspect, in part, this film has been engineered as a marketing ploy to jet fuel his minor-key career into the junk blockbuster comedy movie star stratosphere (e.g. Kevin Hart, Adam Sandler, and a bunch of other un-funny men whose careers cause me mental anguish). I don’t think it’s going to work. To his credit, Miller subsumes himself to the ensemble, but he is also really one note. Playing the shaggy-haired, spoiled, left-of-center party boy is a limited run, and Miller may have already overstayed his welcome. Perhaps, not unlike Office Christmas Party, he will surprise us, embracing more of the nerdy sweetness that makes him endearing and losing the raise-the-roof shenanigans that make him obnoxious? Time will tell. 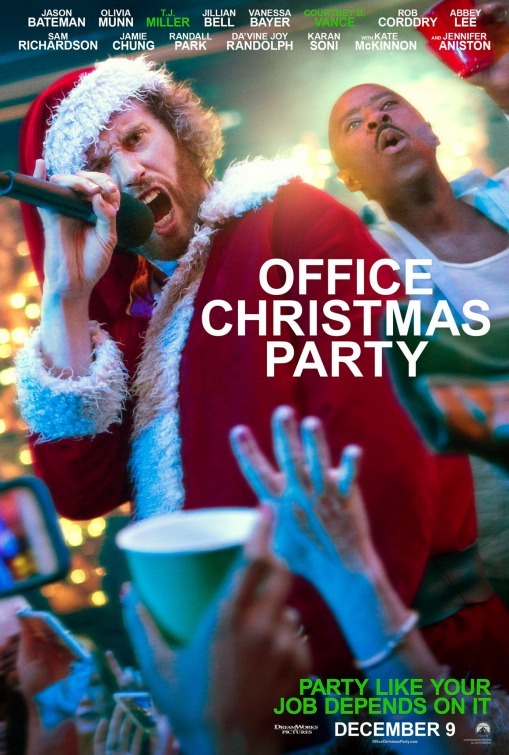 As for Office Christmas Party, underneath its holiday gross-out gimmicks, this is a movie where people care about one another and where the existential threat of losing one’s job has meaning beyond setting up the next joke. Where Miller and company succeed is in the camaraderie and care they show their fellow man. Directed with workmanlike vigor by Will Speck and Josh Gordon, sitcom stupid set-ups abound, but there are lovely quiet moments as well. For instance, Bateman’s office-rounding as he starts his day is filled with gentleness, redirecting various associates as they bully one another or spin perilously out-of-control under the white hot glare of office politics. Furthermore, as the film devolves into broad comic silliness (car chases and the like), the primary characters still worry about each other, and their actions (extreme and cartoonish as they are) still come from a place of compassion. This might be one of the first office Christmas parties where you’ll want to spend more time in the office and less time at the party. And speaking of Christmas, enjoy this lovely Old Type Writer column by my talented mom Susie Duncan Sexton titled “Christmas Gift! Christmas Gift!” (here). Here is an excerpt from the piece: “Observing that impressive restoration feat from afar thrills my very soul. I look forward to grabbing a hard hat and touring the completed facility sooner rather than later. I have driven by the Whitley Street location multiple times. The lump in my throat and the beating of my heart transform into a beaming smile on my old wrinkled, liver-spotted face. Blue Bell, Incorporated has been my life since birth! Happy to have been a part of this metamorphosis!” Read the column by clicking here.